The odds are that Pope Francis 'blew it' in the recent comment on the atheist doing good. However lets give him the benefit of the doubt since he recently also said that Jesus cannot be found outside the Catholic Church, as St.Ignatius of Loyola understood it. Being a Jesuit today, the pope could have assumed that an implicit and invisible for us case of an atheist being saved, is explicit and visible for him and us.So this case of an atheist being saved is an explicit exception to extra ecclesiam nulla salus and the Jesuits St.Ignatius of Loyola, St.Robert Bellarmine and St.Francis Xavier.It would also be an exception to the teachings of the past popes. According to the Jesuit saints, an atheist needs Catholic Faith and the baptism of water for salvation (Cantate Domino, Council of Florence 1441 etc.) Pope Francis does not know any exception. If practically he does not know any such case why mention it in theory? Magisterial documents and the Jesuits saints, besides other saints, say all non Catholics need to convert and Pope Francis does not know any atheist who does not need to convert.For salvation just faith is not enough. The atheist needs Catholic Faith and the baptism of water (AG 7,CCC 846) in the present times. Talk to a Jesuit on this subject today and the odds are ,with a straight face he will tell you he can see an atheist saved in the present times, may be even more than one, whom he personally knows. Re: Odds are that Pope Francis 'blew it' in the recent comment on the atheist doing good. Please stop being the "EENS police". As I said, "Joe and/or Sally atheist" could have been sacramentally baptized in their infancy and received salutary repentance at death's door. As all salvation is invisible, we cannot really know if Pope Francis will be saved, can we? Ditto for Joe and/or Sally. As I said, "Joe and/or Sally atheist" could have been sacramentally baptized in their infancy and received salutary repentance at death's door. Totally irrelevant to the dogma. Joe and Sally's case would be only known to God. Since it would be unknown to us it cannot be an exception or relevant to the dogma. So it means that the atheist is oriented to Hell and Pope Francis and all of us do not know of any exception. 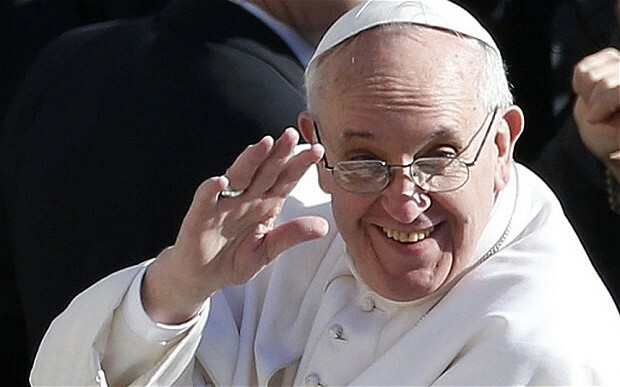 As all salvation is invisible, we cannot really know if Pope Francis will be saved, can we? All salvation in Heaven is physically not visible for us. However the Church does say that all need to convert into the Church to go to Heaven and avoid Hell, Vatican Council II says the same(AG 7). The Church also says that those who are in mortal sin and have not chosen to receive God's Mercy in the Sacrament of Confession, are on the way to Hell. Also those who know about the Church and do not enter are also oriented to Hell (LG 14)-and of course we do know a single such case. If he does assume that there is a defacto exception in the present times, he probably thinks these cases are visible for us. Lionel A wrote: However the Church does say that all need to convert into the Church to go to Heaven and avoid Hell, Vatican Council II says the same(AG 7). Lionel A wrote: The Church also says that those who are in mortal sin and have not chosen to receive God's Mercy in the Sacrament of Confession, are on the way to Hell. Lionel A wrote: Also those who know about the Church and do not enter are also oriented to Hell (LG 14)-and of course we do know a single such case. Every human being, without exception, is oriented to eternal Hell due to "original sin alone". It does not matter if such an individual is "invincibly ignorant" of the Catholic Church or not! One's ignorance does not "cleanse" one of original sin! Yes with Original Sin every one is oriented to Hell but there is hope. Yes with Original Sin every one is oriented to Hell but there is hope.With the baptism of water and Catholic Faith this changes. This of course does not mean that they are already condemned or that they are lost from the beginning. They have the opportunity to convert and to save their soul.So I say they are oriented and not condemned.